Bioluminescence is the term for the light produced by a living organism. 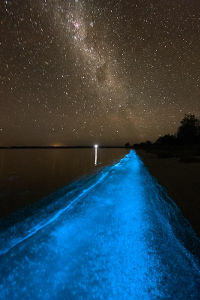 The bioluminescence seen in this photo is caused by marine-dwelling species of dinoflagellate Noctiluca scintillans. It uses an oxidative enzyme in the luciferase family to produce the glow. A similar luciferase is used in other bioluminescence species such as fireflies, a few beetles, some bacteria, as well as other dinoflagellates. The function of bioluminescence in dinoflagellates has been hypothesized to be a form of communication between each other. 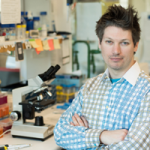 Early work suggested it might serve as a warning system of sheer forces of near by preditors, more recent work suggests it might play a role in maintaining and synchronizing circadian rhythm (internal cell clock, for keeping track of cell cycle). Large version of the droplets, and large version of the starscape. Mallipattu SK, Haidekker MA, Von Dassow P, Latz MI, Frangos JA. Evidence for shear-induced increase in membrane fluidity in the dinoflagellate Lingulodinium polyedrum. J Comp Physiol A Neuroethol Sens Neural Behav Physiol. 2002 Jun;188(5):409-16. Deane GB, Stokes MD. A quantitative model for flow-induced bioluminescence in dinoflagellates. J Theor Biol. 2005 Nov 21;237(2):147-69.